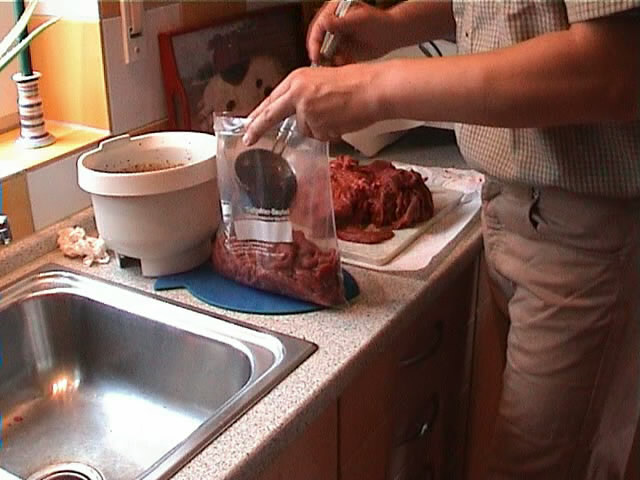 In the next step you have to cut the meat into thin slices and marinade the meat strips overnight in the fridge. IImportant: If you are working with raw meat, you must take the utmost care to insure the best possible sanitary conditions to avoid bacterial contamination (E. Coli, Salmonellae). Wash your hands thoroughly before and after handling the meat, make sure all knives and other kitchen utensils are cleaned by rinsing them with soap and boiling water afterwards. NEVER work with raw meat if you have any open wounds on your hands or fingers! Please also read the "food safety guidelines for jerky". First, you’ll need to trim any fat or sinews that may be in the meat. 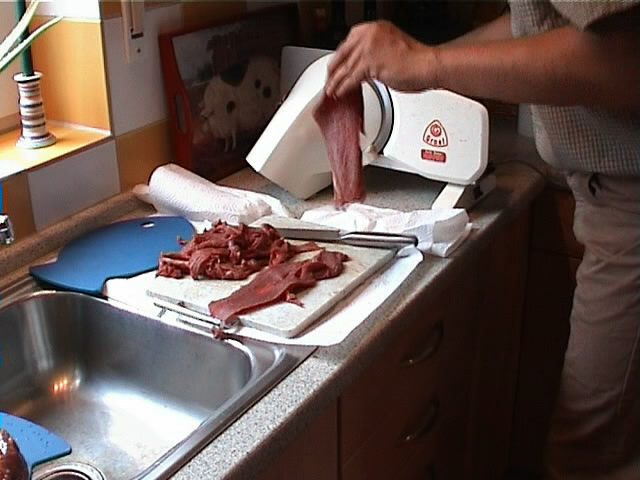 Then, you must cut the meat into thin slices with an appropriate cutting device, such as a slicer. Take a sharp knife and cut away anything that looks like fat or sinew. If you leave fat or sinew, the meat will get rancid with time and ruin your jerky! I keep all the remains in a separate bag, freeze them and make a beef soup/stew out of it later - delicious! A normal kitchen or electric knife is not very useful if you want to cut even, thin slices from a solid meat block – so, if you’re planning to make jerky regularly, you might consider getting a mini meat slicer or a solid cutting machine made out of metal. I recommend using an EVEN blade, those standard zigzag blades that you normally get are not the best for cutting meat. 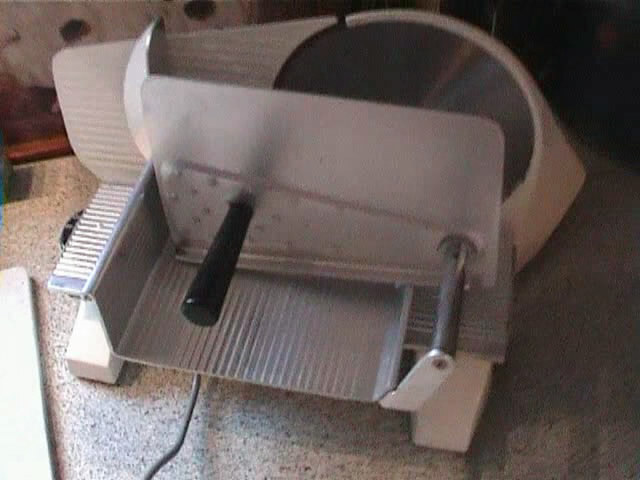 A standard bread slicer machine is not intended to be used for meat cutting, but if you freeze the meat a few hours before the cutting, it might also work - but keep in mind that the engines of those machines are not made to run over a longer period of time, so make sure you’re not overheating the engine! Important: You´ll have to clean you cutting machine afterwards very thoroughly ! I´m using an older mini meat slicer with a large even blade made out of metal. The length and shape of the strips is not important - I´ve read the "classic" Beef Jerky strip is one inch wide, but I really don´t care - if you end up aith a very long or wide strip, simply take a knife and cut it in half - the drying time is mainly dependent on the thickness of the strips rather than the lengh. Immediately, after cutting, equally place the strips into 5-6 Ziploc bags (maximum of 2 pounds per bag) , and - after you stirred up the marinade one last time - take a ladle or other suitable utensil and fill each Ziploc bag with 2 or 3 ladle-fulls, so that the meat strips are almost completely covered with marinade. The next step is very important: close the zipper almost completely, BUT leave a little slit open on one side. Now use your hands to completely press out the air inside the bag - when all the air is gone, close the bag completely! 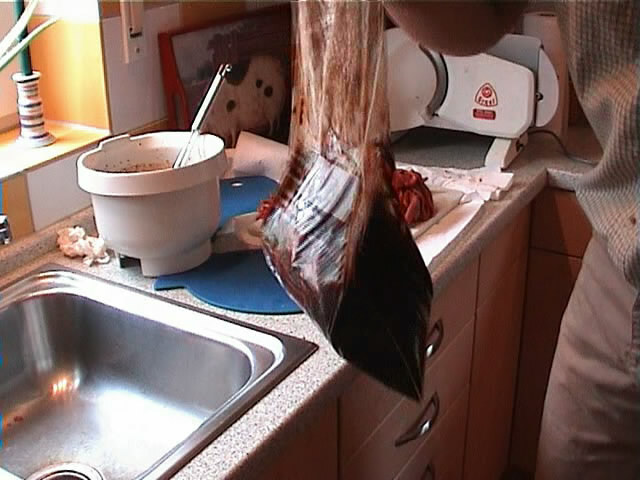 The same process is repeated untill you´ve cut all the meat - you shold now have 5-6 bags full of meat strips in marinade in your fridge! Now you must allow the meat to be marinated for at least 4 hours (8-10 hours recommended), I always let the meat marinade overnight. It is a good idea to take out the bags from time to time, squash them a little and turn them around, so that every strip in the bag is equally marinated. 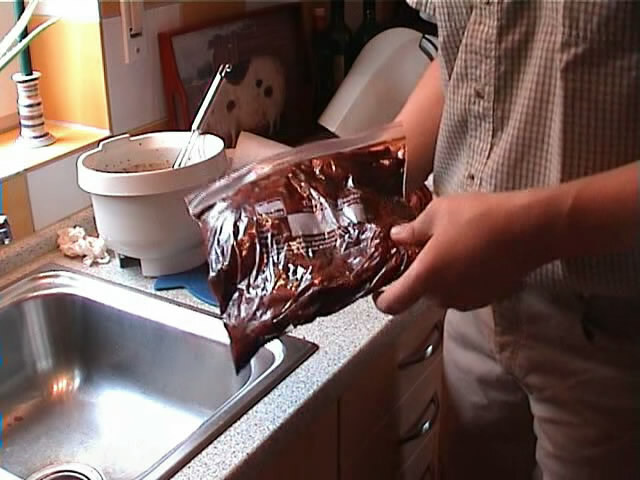 By the way, it is not a problem to keep the meat in the marinade for several days, as long as you keep in the fridge and leave the bag closed. The meat strips will be fully marinated after 10 hours, and there is no danger to "over marinade" the meat. If you’re drying a lot of strips (like in this recipe, 12 pounds) and you don’t have a professional drying machine or chamber, you’ll have to dry several batches anyway. 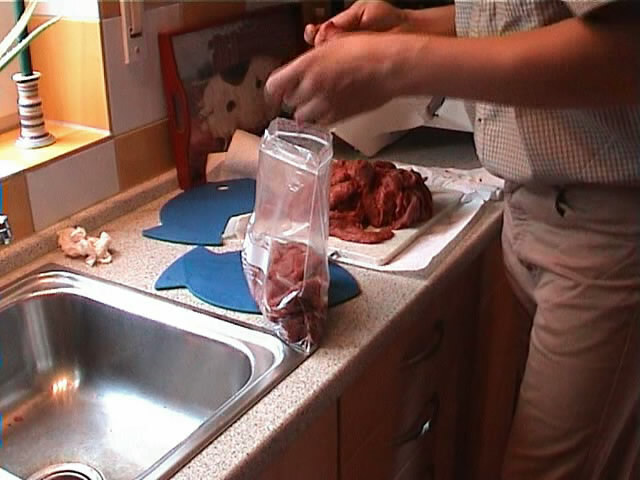 So, it’s nearly unavoidable to keep some of the bags in the marinade a little longer time - but as I said, no problem! The next chapter is about Drying the Meat!